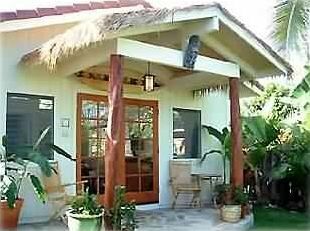 Our 'South Seas Cottage' is located approximately one block from world famous Kailua Beach. Our new tastefully decorated 'Island Style' cottage is surrounded by mature tropical landscaping. Step through the French doors and walk on bamboo style floors and fine Asian slate. Island furnishings from the South Pacific and Asia will comfort you during your stay. Kailua Beach was ranked #1 in the United States by Steven Leatherman, a.k.a. Dr. Beach, in 1998. Our three mile stretch of fine white sand beach is unsurpassed. Kailua Beach is the perfect setting for relaxing, swimming, snorkeling, surfing, windsurfing, boogie boarding and just doing nothing. Our cottage is just a short walk to the beach, restaurants, shopping, theaters and much more. Our gated island cottage is a one bedroom with a queen size bed. The bedroom can be opened up for more spacious living (as shown in the picture) or closed off from the living area by louvre doors. Our luxurious bathroom includes a large corner tub with shower surrounded by Asian slate floors. French doors open to tropical gardens and a 'palapa style' porch setting, perfect for a BBQ. We look forward to sharing our island home with you and hope that your stay is filled with the 'aloha spirit', hospitality and friendship. We had a great 4 day stay at Gina and Karl's cottage. Karl greeted us when we arrived and was very friendly and welcoming. The cottage's architecture is marvelous; an open and airy space, but can also become more intimate with its unique shutter design system. The cottage is decorated with tasteful furnishings and has a great beachy vibe. The cottage is situated in a glorious location and is very convenient to all that we love about the Kailua area: downtown Kailua, breakfast at Cinnamon's, malasadas at Agnes Portuguese Bakery, dinner at Buzz's, Willow Tree Korean BBQ, Baci Bistro, and last but not least, Porky's, a great little dive bar. But the best part is that the cottage is just a short five minute walk to the most wonderful beach to enjoy for as long as one wants. And just down the road is Lanikai Beach, another beautiful spot! Gina and Karl are the perfect hosts. Helpful and accommodating, as well as giving total privacy. We hope to stay again at their little paradise abode the next time we visit the area. Our experience was very comfortable and satisfying and we highly recommend it! Great location, cute place, TERRIBLE BED. The owners were very nice. It was a good location. There were boogie boards and snorkeling gear on the side of the house for use. The place itself was clean and cute but needs some improvements. The listing said there was a washer and dryer. The W/D were outside next to the house, uncovered, rusted. Not even sure they were useable. The bed was absolutely terrible. So hard we almost wanted to sleep on the floor. The top of the kitchen fridge was rusted although in that climate Im sure that happens frequently. If it wasn't for the bed we probably would have been happy with our stay. This is a truly amazing and very relaxing place. Owner hospitality is unbeatable. I’d stay for months if I could. Thanks K .... neva Ewa. Very nice, comfortable cottage close to the beach and food. Far enough away to relax but close enough with great amenities. Would definitely stay here again!! Nice cozy cottage close to everything! Hoping for a return visit! Book it Before It's Gone! South Seas Cottage was the perfect place to set the relaxed mode for our vacation. It was well stocked, clean, private, well decorated, and located centrally for all of our sightseeing activities. The cottage had everything we needed. Each morning we enjoyed the use of the well stocked kitchen (hot plates, coffee maker, toaster, plastic wrap, ice, salt, pepper, etc.). Although I did not intend to use the laundry machines, they came in handy for fresh beach towels each day. We also enjoyed the use of the private outdoor space and Barbecue in the evening for steak and burgers. The pictures are exactly what you get. All of the Hawaiian decor was placed to perfection and clean. Cleanliness is key to enjoying our stay on vacation. The location of the South Seas Cottage was very private while having great hosts who would go the extra mile to help you out in anyway or give you some advice to enjoying the island. My husband and I are busy people who like to explore. Therefore, Kailua was the perfect central location to many of our adventures (Ko'Olina Beach Lagoons, Wakiki shopping and food, Pearl Harbor, Hanauma Bay snorkelling, Koko Head Trail, Manoa Falls, Dole Plantation, Banzai Pipeline, Puaena Point surfing and shops, Polynesian Culture Center, etc). While in Oahu we also stayed in Wakiki and both of us much preferred Kailua. The beach was quiet, the traffic was slower, the stores were more local, and the PillBox Hike was our favourite of the hikes we completed.